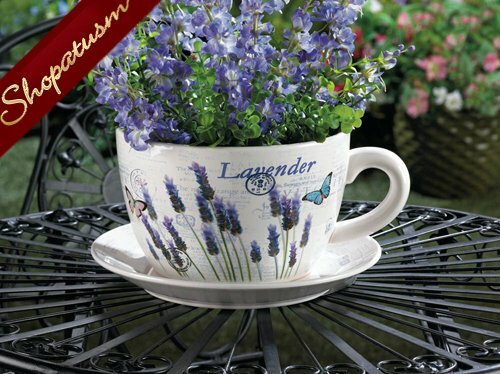 This is for a Lavender Fields Teacup Plate Charming Planter for Plants from Shopatusm. This teacup planter is ready to doll up your favorite greenery with its pretty design that features lavender blooms, butterflies and travel stamps. Drain hole in the bottom. Item weight: 3.2 lbs. Teacup: 9 1/4 inch x 7 1/2 inch x 4 5/8 inch high; plate: 9 inch diameter x 1 1/4 inch high. Dolomite. Plant not included.